For those who don’t know, Chapter 11 is a bankruptcy process by which the court oversees a negotiation to establish a ‘plan of reorganization’ between a debtor and their creditors. This sort of bankruptcy is not just for corporations. Individuals whose income is too high for Chapter 7 bankruptcy and whose debts are too high for Chapter 13, can file for Chapter 11 protection as well. 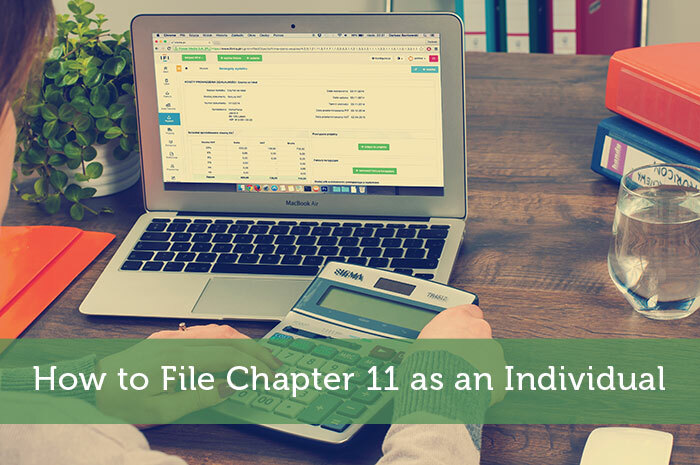 As such, we will look at the ins and outs of Chapter 11 for individuals including how to file. One of the first things you need to know about Chapter 11 is that upon filing you will receive what is called a ‘automatic stay’. This is an order which stops creditors from taking any collection actions. This helps you to force your creditors to the negotiating table to work out a plan which works for both sides. Remember a Chapter 11 will not wipe away all of your debts, but it will allow you to reorganize them and in some cases even work out a ‘haircut’ by putting together a payment plan which you can live up to. While people can file Chapter 11 bankruptcy as well, it is often the last choice and doing so will depend on your situation. The choice to file for Chapter 11 has more to do with the inability to qualify for bankruptcy under Chapters 7 or 13. In addition, filing for Chapter 11 might lead to additional costs such as the filing fee, trustee fees, and the cost to prepare and distribution what is known as a disclosure statement and creditor ballots. Despite the minutia, Chapter 11 is often seen as a good fit for an individual whose disposable income is considered too high. There are also property benefits under Chapter 11, such as reducing the amount due on a car if it was purchased less than 910 days before filing for bankruptcy – this is called a cramdown. When deciding whether to file for Chapter 11 bankruptcy, the first step is to perform what is called a means test. This will determine whether the applicant can qualify for what straight liquidation under Chapter 7. In doing so, an applicant must prove that their disposable income is too low to make any meaningful payments to creditors. This is determined by looking at your actual income compared to the median income in your state and then subtracting ‘reasonable expenses’ – i.e. housing, food, healthcare. If you qualify, then the court-appointed trustee would order the sale of all non-essential assets and these funds would be used to pay back your creditors. If you don’t qualify under Chapter 7, then the trustee would determine whether Chapter 13 would be the right fit. In doing so, the trustee would see whether a simplified debt reorganization plan would allow you to pay back your creditors within five years or less. However, your combined debt cannot exceed $1,184,200 in secured debts or $394,725 in unsecured debt. As you can see, there might be instances when neither Chapter 7 or 13 would be a good fit. This is when Chapter 11 comes into consideration. As mentioned filing, would lead to an automatic stay and then the next step would be to proceed with negotiations with your creditors. Now, you will need to show the court your complete financial situation. This includes your income, assets, and debts. Part of the reason why debtors would consider negotiating at this point is that failure would force the courts hand and they might push you into Chapter 7, which could mean they end up with nothing. Another advantage of Chapter 11 is that you can customize the reorganization to meet the specific characteristics of your financial situation. As such, you want to propose a plan which helps you to keep most of your assets intact, while giving you the time needed to pay back your debt. If the plan is considered reasonable and offers your creditors to get back most of the amount owed, they will usually vote for the plan. However, you will need to confirm this with your bankruptcy lawyer especially if some of your creditors are known for being tough negotiators. In the end, all forms of bankruptcy are a chance to get a fresh start. If you are struggling to meet your debt obligations, it should be considered as it is usually simpler and cleaner than other options. Also compare the difference between chapter 7 and chapter 11 bankruptcy.